Construction sector is growing rapidly in Oman as the government is highly investing in infrastructural projects for development of the country. Construction activities in the areas of public infrastructure, transportation, residential and commercial buildings are driving the demand for Oman Air Conditioner Market forecast revenues over the coming years. According to 6Wresearch, Oman air conditioner market size is projected to grow at a CAGR of 5.8% during 2017-23. In Oman's air conditioner market, centralized air conditioner has captured majority of the share and is further projected to maintain its dominance over the coming years. Demand for window air conditioner has decreased due to increasing acceptance of mini-split air conditioners in the residential and SME segments. Amongst all the end user applications, the residential sector accounts for the largest Oman air conditioner market share. With increasing number of residential projects such as Al Khuwair Gardens, Al Ghubrah Residential, Shinas, Al Hail Residential, and Al Hail Waterfront, the market for air conditioner especially mini-split and ducted split are likely to grow over the coming years. The Oman air conditioner market report thoroughly covers the air conditioner market by AC types, applications, and governorates. 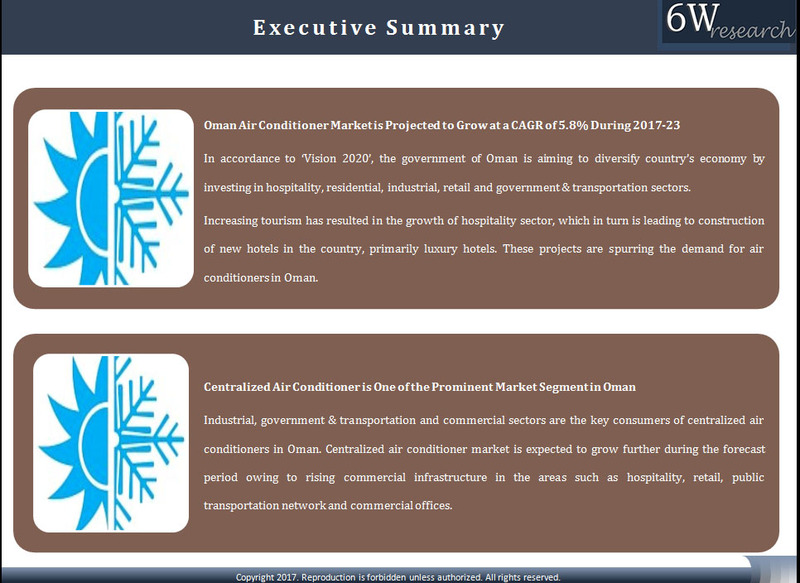 The Oman air conditioner market outlook report provides an unbiased and detailed analysis of the on-going Oman air conditioner market trends, opportunities/high growth areas, market drivers, which would help the stakeholders to decide and align their market strategies according to the current and future market dynamics. 12.4	GREE Electric Appliances Inc.
12.8	Samsung Electronics Co. Ltd.